Chris Norway wrote: Nice one, John! john v. wrote: Nice.. I got my heart coloured red. So this is how my arm lookes like now. Looks good man! Well played. I gotta go back to my tattooist her ein melbs and get my other arm finished. Bloody costly though. 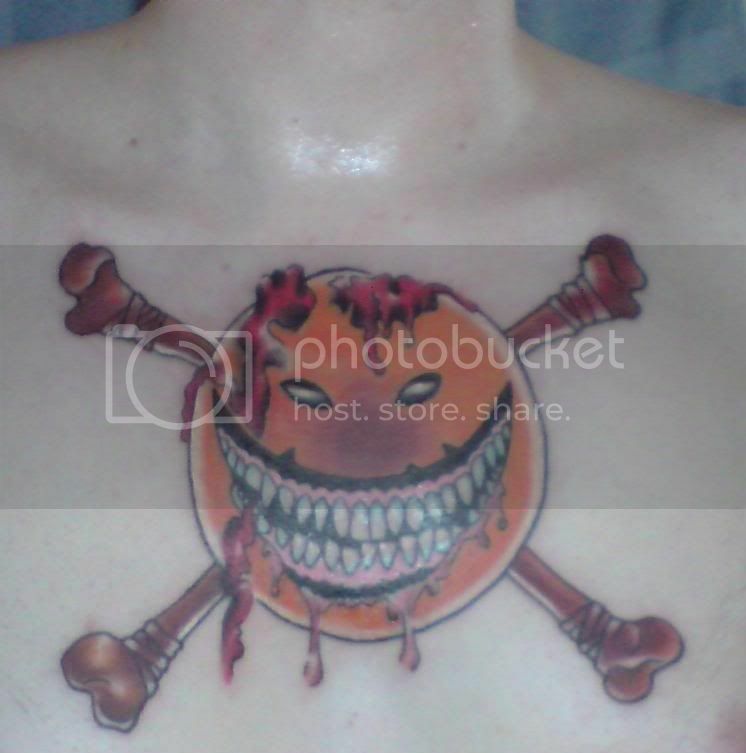 I'm sure you've all seen it already but this is mine, bang on the middle of my chest. For the record, I LOVE Everlone's Dreaming In A... tat and the assorted Riff After Riff ones too. Won't see another smiley bones like that I don't think! Very good. Interesting that you didn't go for the 'colour version' that most of us got. It's different. Nice one. Andy wrote: Very good. Interesting that you didn't go for the 'colour version' that most of us got. It's different. Nice one. Im booked in for the riff after riff logo at the end of January and I was thinking of doing the same with that one. Twist the origonal in to a more intricate and sketch like design just to represent it in an alternate perspective. Whether you've got AC/DC inked on your arm or the Everly Brothers etched on your arse - Bizarre wants to hear from you! What response do you get from people? Would you change or add anything? Have you got any more planned for the future, if so, what? What do you like about having tattoos? Yours looks awesome by the way dude! I would love the outline like Nick says, with just eyes. I've got no tattoos at all and wonder roughly what the smallest/best detailed size would be, anyone got a little smiley bones? Got this yesterday, Emperial tattoo Notodden.